The day after we arrived we travelled east out of Kathmandu for around three hours to the Kavrepalanchok region. There is one main road in Kathmandu which bears the scars of the earthquake and has erupted like a scene out of Superman, but on the whole the roads in the capital aren’t too bad. As we travelled further and further out of Kathmandu, up into the mountains, the roads became more bumpy, neglected and precarious. As a control freak and a back seat driver, overtaking buses or cows on the hair pin corners was well out of my comfort zone. 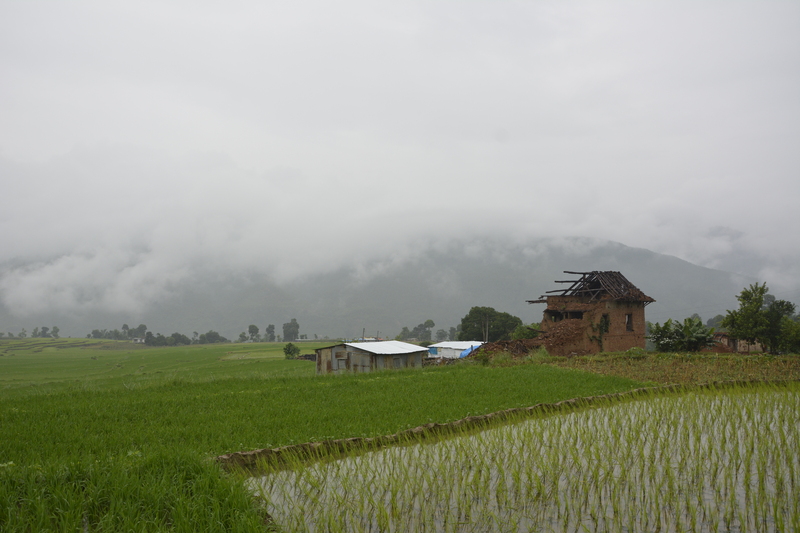 The monsoon season is due to intensify at any moment – yet another obstacle for the Nepalese to overcome in their struggle to start to rebuild. During our journey we had to stop briefly as people cleared a landslide from the road – the earthquake had dislodged soil and rocks from the mountain. 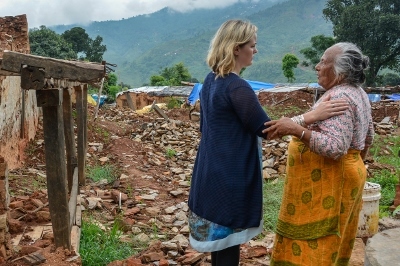 The team from CAFOD’s local partner Caritas Nepal told me that when the monsoon starts there can sometimes be torrential rain for ten days solid and I could see how these mud roads would quickly become impassable. As we passed children who were walking – some of them a very long way – to school, I marvelled at how crisp and clean all their shirts were and how immaculately plaited the girls’ hair was. As the drizzle set in and the dusty mud roads passed the red clay houses I wondered how on earth the mothers get the shirts so clean and dry with no washing machines, a relentless humidity that keeps everything damp and the constant threat of mud all around. We headed to the mountain village of Chandanimandan to see how the earthquake had impacted remote communities and to support Caritas Nepal handing out packs of corrugated iron to help people build shelters before the monsoon rains were in full swing. Chandanimandan, with its lush green mountains amidst the clouds and the beautiful sound of birdcalls, is tranquil. Look closer, however, and it’s a village which has been reduced to rubble, dust and mud. I met Mishri, 74, small, slim and dressed traditionally. Despite all that she had been through, she had a twinkle in her eye. She told me about the day that “the earth moved” when she was in her house and it collapsed around her. She said she didn’t remember how she managed to crawl out from under the rubble. “I felt as if my soul had left me,” she said. “I just stayed there, I didn’t move and I waited for the earth to stop shaking”. 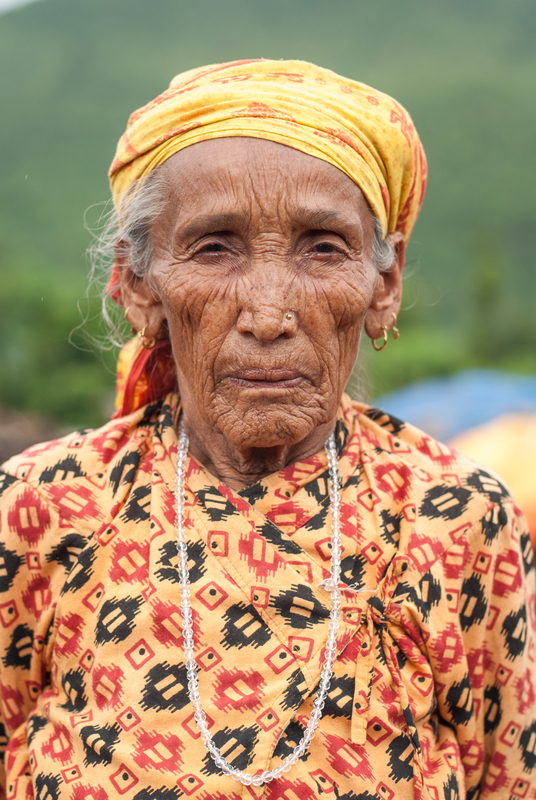 She told me that she thought that the Gods must be angry with them, but when Caritas Nepal arrived with help she felt that they must have been forgiven. She’d had no idea that people would come looking for them. We climbed amongst the rubble that was her life, and I felt useless. As I put out my hand to help her frail frame steady itself on the rocks, she thought that I was asking her to help pull me up – which she did with one firm tug. I think that this pretty much sums up this spirited woman. Next I met Rama, 53, a lady with a smile as bright as her traditional red sari who was working in the fields when the earthquake hit. She told me that when there is an emergency in Nepal, you think: ‘children’ then ‘grain’ then ‘cattle’. When the earth started to rumble beneath her feet, she ran home with the ground still shaking. She checked on her two grown children and three grandchildren, thankfully all safe, but she lost two cows and five goats. 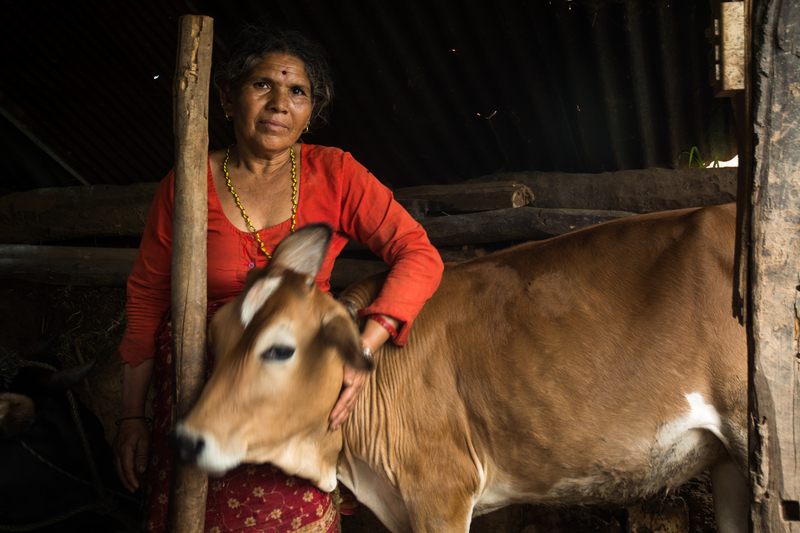 After the earthquake, Rama spent three days digging through the rubble to rescue her calf named ‘Gajali’, which means ‘eyeliner’, after the dark rings around her eyes. Rama has since vowed never to sell her. Finally I met Luma, an 83-year-old woman with an incredible face whose lines told a million stories. In her case, the devastation was clear to see and she is still very much living a nightmare. Luma’s five sons had all built their homes alongside that of their mother and nothing remained of any of the buildings. I got a strong sense that Luma had done everything right in her life and had tried so hard to make a stable future for her family. She told me she had saved for years to supplement her pension. She had kept her gold ring and necklace so that she would have some money should the worst ever happen. The worst did happen and it shattered around her modest possessions. Three months on and a lifetime of hard work and memories are buried deep amongst the rubble with little hope of ever being found. The women I met were in a dire situation. They needed to salvage as much brick, rubble and corrugated sheeting as possible in order to rebuild their homes. This salvaging and rebuilding all takes time and energy that they don’t have. They are living a hand-to-mouth existence; if they don’t work the land they have no money and no food – and they also have to cook, tend the animals, clean clothes and care for the children. 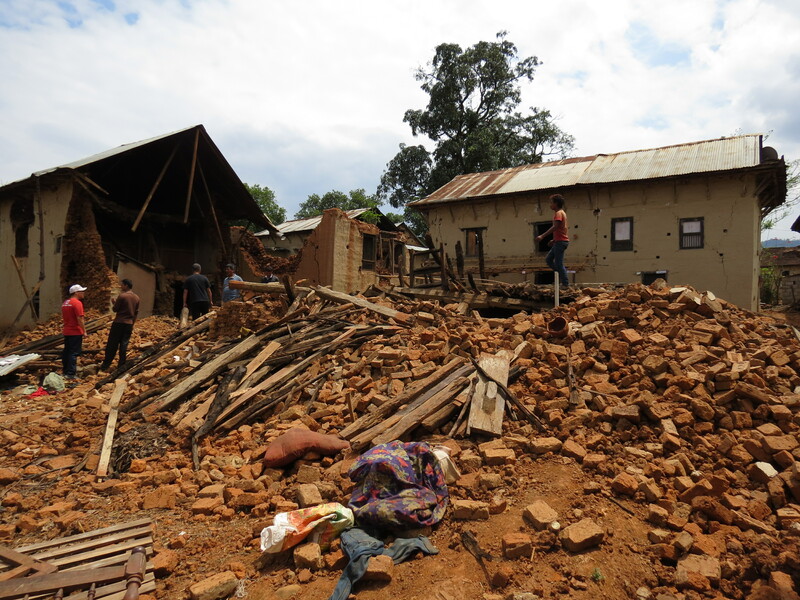 CAFOD and Caritas Nepal began delivering aid within hours of the first earthquake striking. 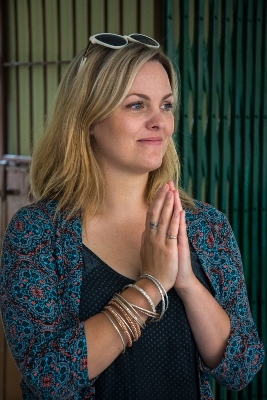 Some of the Caritas aid workers lost their own houses during the earthquake. While their families have been living in tents, they have carried on delivering food and shelter to some of the hardest to reach areas. When the roads become blocked, they have had to carry supplies, trekking through the mud for hours to reach those most in need. I was humbled to be among them as they carried out their work. Since the earthquakes hit, they have provided life-saving food, water and shelter to nearly 300,000 people. But with the monsoon worsening, and with so many people like Mishri, Rama and Luma left with virtually nothing, it is a race against time to reach all those in need. Previous Previous post: Win a professional energy audit for your parish!